Afghan president Hamid Karzai waves as he leaves a press conference at the Presidential Palace in Kabul on July 29, 2010. 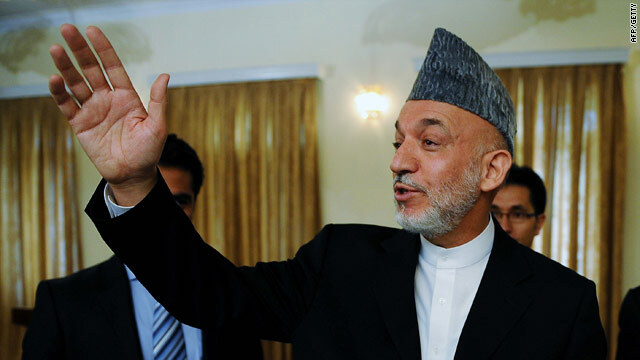 Kabul, Afghanistan (CNN) -- Afghan President Hamid Karzai condemned the stoning deaths of a young man and woman in northern Afghanistan over the weekend, calling the executions by the Taliban "unforgivable." "Executing these two young people without trial is a crime, an act of inhumanity, and is counter to Islam," the president said in a statement Tuesday. The Taliban stoned to death a man and a woman in northern Afghanistan for allegedly having an affair, officials said Monday. The stoning took place Sunday in Dasht-e-Archi district, in the village of Mullah Qali -- a village dominated by the Taliban in Kunduz province. The pair was accused of having an illicit sexual relationship, a spokesman for the Kunduz governor said. The woman was about 20 years old and the man was about 27, said Mohammed Ayuob, district governor of Amam Sahib, which is also in Kunduz province. The woman was engaged, and the man was married to another woman. The two had been held by the Taliban for about a week, Ayuob said.